Samuel Perry Spence was born in Greenville County, South Carolina in 1800. He was named Samuel for Samuel Inman and Perry for his paternal grandmother, Judha Perry Spence Jones, Elisha’s mother. The 1800 Census for Greenville County, South Carolina indicates a family similar to Elisha’s in the John Spencer Household(1). However, the young family had already been making plans to relocate to Mecklenburg County, North Carolina, where Elisha Spence also appears in 1800(2). [Note: Thomas J. Spencer would die in Greenville in 1810. That same year, Levi Spencer relocated to Sevier County, Tennessee. A woman Caroline Toney Spencer’s age appears in his household in Tennessee. However, a woman of Caroline’s age appears in the Abraham Spencer household in Greenville County in 1810. And there is a possibility that Caroline may have returned to Virginia prior to relocating to Georgia with Levi.] The year following their move to Mecklenburg County, a second child was born to Elisha and Susannah. Levi James Spence was born in Mecklenburg County in 1801. He was named for Susannah’s brother, Levi Spencer, and for Elisha’s favorite uncle, James Spence. After Susannah and Levi were able to travel, the Elisha Spence family moved to Randolph County, North Carolina, where the James Spence family still lived. From a very early time, Samuel Perry Spence was surrounded with large groups of families and extended families in the area. After they settled in Randolph, Elisha was able to reconnect with the David and Daniel Jones families as well. By 1804, the Jones families departed for Davidson County, Tennessee–something the Spence and Spencer families would do by 1810. When the Spence family moved to Tennessee, they would reconnect with the Inman family and the Daniel Jones family. [As noted in a previous article, David Jones died before April 1806 in Davidson County, Tennessee(3).] John David Spencer, Susannah’s brother, settled in Stewart County, Tennessee, where he appears on the 1810 Census(4). By 1820, John Spencer relocated to Perry County, Tennessee, where he appears on the Census as living close to the Samuel Inman family(5). And by 1820, Samuel Perry Spence, his brother, Daniel Spence, and possibly Levi J. Spence, had moved to Perry County where they were living with their uncle. Some young men their ages appear in the John Spencer household that year. On May 25, 1824, Samuel Spence married Elizabeth Inman (1808-1872)–the daughter of Samuel and Mary Williams Inman–in Davidson County, Tennessee(6). They were living in Perry County, Tennessee at the time and there is no return date on the marriage license. In all likelihood, they had to travel to Davidson County to get the license. The wedding was in Perry County, and no return date was filed. The story of Elizabeth’s Inman family is found in Part Three of this series, so I will not repeat it all here. 1. Susannah “Susan” Diane Spence (1825-1830). Susan was born July 31, 1825 in Perry County, Tennessee, and she died after the 1830 Census in Perry County, Tennessee. 2. Lazarus Spence (1825-1902). Lazarus was born July 31, 1825 in Perry County, Tennessee(8) and he died November 15, 1902 in Jasper County, Missouri(9). He was known as “Laz” Spence. On December 3, 1848, he married Adeline Elizabeth Bryant (1833-1931) in Jasper County, Missouri(10) [Note: The wedding license is December 3, 1848. The actual ceremony took place December 23, 1848]. She was the daughter of Daniel Bryant (1803-1858) and Lucy Key (1810-1903). They had no natural children but adopted two daughters: Marion Elizabeth Vermillion Spence (1858-1926) and Martha Jane Vermillion Spence (1860-1915)(11). 6. Milly Catherine Spence (1837-1896). Milly was born January 27, 1837 in Jasper County, Missouri, and she died August 28, 1896 in Jane, McDonald County, Missouri(20). On July 26, 1855, Milly Catherine married James Henry Bunch (1834-1929) in Jasper County, Missouri(21). He was the son of Eli Bunch (1795-1872) and Nancy Bullington (1800-1852). Their children were: (a) Elvira F. Bunch (1856-1934); (b) Nancy Elizabeth Bunch (1858-1941); (c) Nimrod P. Bunch (b. 1864); (d) William Henry Bunch (1867-1880); (e) Sarah K. Bunch (1873-1880). 7. Newton Jasper Spence (1841-1882). Newton was born July 4, 1841 in Jasper County, Missouri, and he died May 18, 1882 in Milburn, Johnson County, Oklahoma(22). His wife was Mary Jane Brooks (1850-1880), whom he married about 1868 in Oklahoma. She was the daughter of John and Martha Brooks. Their children were: (a) Newton Jacob Spence (1869-1954); (b) Alice Bell Spence (1871-1913); (c) Mary Jane Spence (1873-1959); (d) John Jasper Spence (1875-1954); (e) Martha Elizabeth “Daisy” Spence (1877-1934); (f) James Louis Spence (1878-1934). 8. Sarah Elizabeth Spence (1843-1912). Sarah was born January 1, 1843 in Jasper County, Missouri(23), and she died July 3, 1912 in Vernon, Wilbarger, Texas(24). She was married to John Hull (1844-1908) in Grayson County, Texas. He was the son of John Hull (1798-1858) and Sarah St. Clair. Their children were: (a) Sophia Hull (1870-1953); (b) Millicent Catherine Hull (1872-1953); (c) Belle Hull (b. 1877); (d) Connie Hull (b. 1884); (e) Mary Hull; (f) Mable Hull; (g) Lizzie Hull; (h) Johnnie Hull. 9. Louis (Lewis) Wesley Spence (1844-1890). Louis was born December 10, 1844 in Jasper County, Missouri(25), and he died May 16, 1890 in Prairie Grove Twp., Washington County, Arkansas. On March 31, 1875, he married Amanda Miranda “Mandy” Taylor (1855-1921) in Washington County, Arkansas(26). They had two children: (1) Annie M. Spence (1876-1894); and (2) Samuel Lee Spence (b. 1877). Samuel and Elizabeth Inman Spence remained in Perry County, Tennessee until 1836 or 1837. His sister, Milly Catherine, and his brother, Daniel, preceded him in relocating to Jasper County, Missouri. The oldest son of Elisha and Susanna, Samuel probably waited behind to settle his father’s affairs. And then his family headed west to Missouri, where they joined the others, leaving Tennessee behind. (2) 1800 Census for Elisha Spence, Mecklenburg County, North Carolina. National Archives Census Film. Accessed at the Denver Public Library, Denver, Colorado. (3) David Jones Estate Inventory, April 1806. Roll 427, Book 3 (1805-1816), Davidson County, Tennessee Probate Records. Tennessee State Library and Archives, Nashville, Tennessee. 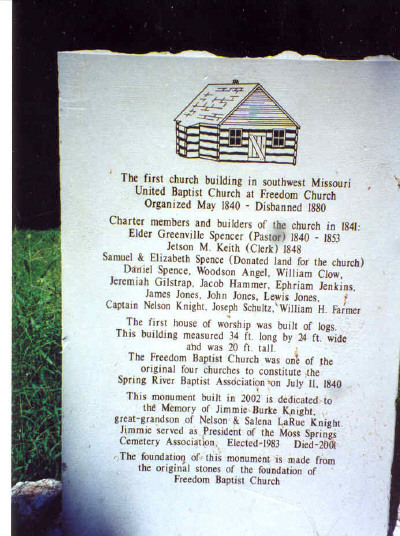 (21) Missouri Marriage Records, 1805, 2002, Ancestry.com, Provo, Utah. Date Accessed: 10 Jun 2015. Available online at http://www.ancestry.com. (26) Arkansas Marriage Records (1820-1949), Ancestry.com, Provo, Utah. Date Accessed: 10 June 2015. Available online at http://www.ancestry.com.